He’s already marked his company’s 30th year in business – and now technology entrepreneur Rafi Razzak has an extra reason to celebrate. 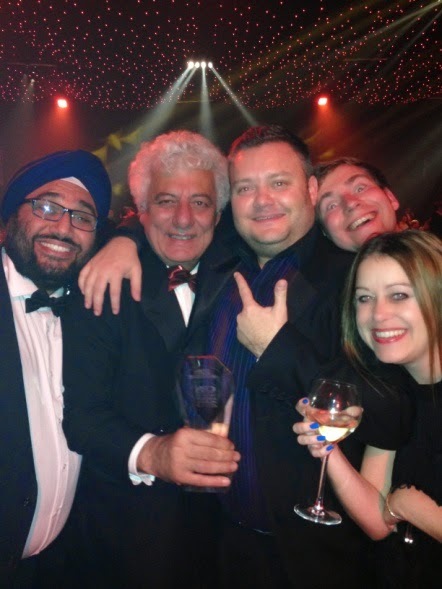 Rafi, founder of Basingstoke company Centerprise International, was named Personality of the Year at the CRN Channel Awards 2013, held at London’s Battersea Park Events Arena. The highly-regarded awards, celebrating their own 20th anniversary, honour the best companies and people in the technology industry. The award caps off a great year for Centerprise, which marked three successful decades in business with a party for 500 invited guests in October. After the ceremony, CRN editor Sara Yirrell said Rafi was “definitely a worthy winner”. She added: “To survive the ups and downs of the IT industry over the years is no mean feat, and to have founded a company 30 years ago that is still going strong and expanding is a true achievement. Rafi said: “This award was so unexpected and I am delighted to have won during this memorable year as the CRN Awards celebrate their 20th anniversary and Centerprise celebrates its 30th anniversary. Rafi, born in 1949, spent five years with IBM after graduating from Imperial College University, and went to to PACC International as vice president for four years. In July 1983, with £100,000 capital, he founded Tulips Enterprise, which was renamed Centerprise International in 1988. The company had initial success as a computer manufacturer and went on to provide managed IT services and to become one of the leading resellers of computer systems. The company has had a 20-year partnership with the Ministry of Defence, which Rafi has been instrumental in maintaining. Over the years the company has won numerous awards and is now expanding through investment, joint ventures and acquisitions into up-and-coming technology companies. They include computer recycling company Partners IT, cutting-edge gaming PC company YoYoTech and OnCommerce, the company behind OnBuy, a British online marketplace. Pictured (left to right): CK Kohli of Centerprise Group company YOYOTech, Rafi Razzak, Nick Boardman, a consultant at Centerprise, Phil Boyes, Centerprise Defence & Security Business Manager, Emma Loveless, Centerprise Distribution Sales Manager.